How many times have you tried to cook eggs in the microwave, only to hear a loud explosion, find a mess to clean-up, and have breakfast ruined? 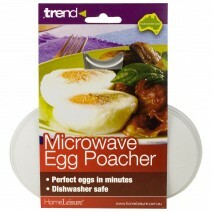 Rediscover the easy way to poach eggs, thanks to the Trend Microwave Egg Poacher by HomeLeisure. With two deep poaching areas, a comfortable-to-carry, cool-touch handle, and made with quality microwave-safe material, the Trend Microwave Egg Poacher by HomeLeisure makes cooking eggs easy. Unlike some other egg poachers, ours features a sturdy, snap-lock lid that retains heat to help cook your eggs more quickly, and stops your eggs from going everywhere should they get too excited. By keeping your poached eggs secure, there will be more on your toast and none left in the microwave. Enjoy delicious, perfectly-cooked poached eggs for a healthy breakfast every day with the Trend Microwave Egg Poacher by HomeLeisure. They're delicious on toast or an English muffin! As it is easy to clean-up, you'll be able to get on your day with no fuss. Buy the Trend Microwave Egg Poacher by HomeLeisure now and get ready for a relaxing breakfast with beautiful poached eggs next weekend. 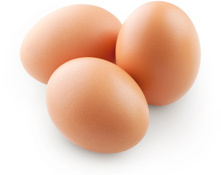 To prevent your eggs from exploding, rinse the poacher (do not dry) and add a teaspoon of water after adding the eggs. You must pierce the egg yolk membrane thoroughly prior to cooking. Cook on medium only, and allow to stand for up to a minute before opening and serving. Rinse then break eggs into the poacher, centring the yolks in the ridged well, and pour one teaspoon of water over each egg. These times are a guide only, and you may need to experiment a little initially. Times are based on small eggs from the refrigerator. Allow to stand for up to a minute before removing the lid. Pierce yolks a second time, then slide a knife around the egg to help it remove. Serve eggs on toast or muffin.